Cosmetic dentistry is everywhere. It's on signs, in magazines, on TV and in the phone book. It almost looks like a new dental specialty. Actually fine dentists have been interested in cosmetics for a long time, only it was called Esthetics. 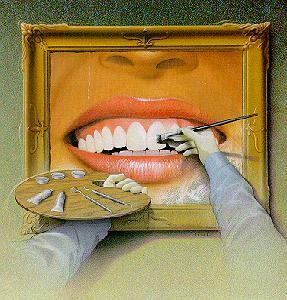 Why any dentist would want to perform dentistry without trying to make someone look the very best that they could is a mystery. It is true that with many of the new materials we can do a much better job, easier than we could in the past. Concepts such as the "Golden Proportion", and that when ideal form and function are taken into consideration and optimized, dentistry will look the most natural and esthetic. It takes many small details to accomplish the best possible end result.